IPSec logs show IPSec VPN information. 1. Go to Reports > Logs > IPSec. 2. To filter the log by a specific tunnel, select it from the Tunnel name drop-down list. 3. 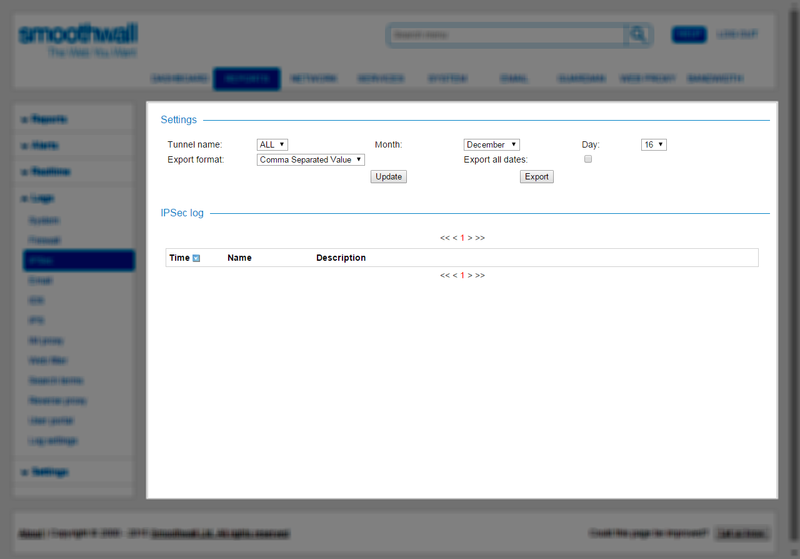 To filter the logs for a specific time period, specify the date using the Month and Day drop-down lists. Log entries are displayed over a manageable number of pages. To view a particular page, click its Page number hyperlink displayed above or below the log entries. The adjacent << (First), < (Previous), > (Next) and >> (Last) hyperlinks provide an alternative means of moving between pages. To sort the log entries in ascending or descending order on a particular column, click its Column title hyperlink. Clicking the currently selected column reverses the sort direction. You can also choose to export IPsec logs to a chosen format. 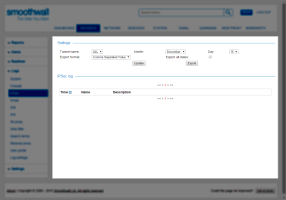 • Tunnel name — From the drop-down list, choose the tunnel to export. Choose ALL to export information about all configured tunnels.